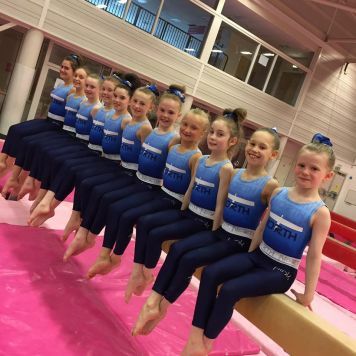 Our North of England Regional Squad girls attended their second squad of the year during the Easter holidays, which took place at our gym. The girls trained for the full day alongside a number of other clubs from around the region working with over 30 gymnasts and coaches. The day consisted of a large group conditioning circuit, followed by basics and then splitting off into various different mixed club groups. The gymnasts and coaches then broke for dinner and the coaches listened to a judging workshop led by Karen and Kelly. The afternoon saw the gymnasts completing another conditioning set followed by apparatus work and finishing off with a stretching circuit. All gymnasts and coaches had a fantastic day working with different clubs, looking forward to the next summer squad!